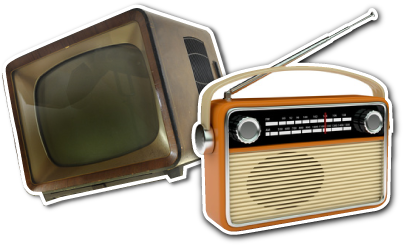 Radio or TV: Which is better? - Shout! Radio or TV: Which is better? Ask a client what makes a successful campaign and Broadcast PR is likely to be at the top of their wish list. But if budgets and/or logistics are limited, and you have to pick one, which is better: radio or TV? In an ideal world you’d have both! But if you have to choose, you need to consider the story, audience and goals of the client before deciding which is the best fit for your campaign. Radio gives you a huge chance to target and tailor your story to the right audience. It carries huge reach both regionally and of course nationally, and certain slots are hot tickets for news worthy stories. Live radio particularly offers fantastic opportunities for a spokesperson or case study to secure key client messages and worthy branding. You might be surprised too at the length of the chats which vary from a couple of minutes on a BBC regional breakfast show, to several minutes on BBC mid-morning and smaller commercial stations. Larger commercial stations meanwhile are more likely to run a shorter, pre-recorded clips– but they generally agree to a brand mention and their bigger audience reach adds to their value. A word of warning though – good spokespeople are key for radio as they need to work in messages clearly and succinctly in an entertaining and engaging way. They need to be able to paint a picture with words as well as casually but relevantly drop a brand mention or key message into an answer. If your story is research based then radio is your friend. TV obviously needs pictures to illustrate a story, which is a difficult thing to do with research but these stories can make good talking points for radio. Radio also tends to be a more reliable form of broadcast as, even with a breaking story, the sheer amount of radio stations means your story is less likely to get dropped from a radio schedule than a TV one. It’s for this reason that at Shout! we guarantee our radio coverage – we’ll still aim high in terms of quality opportunities, but even on a busy news day we will hit target. The volume of stations also allows you to target channels that best suit your client. BBC regional radio, for example, tends to have an older age profile around 45-65 whilst commercial radio stations appeal to a younger audience. For many clients though TV is the icing on the cake. The visual aid of pictures means that the focus on other aspects such as spokespeople and research isn’t, in my view, as closely scrutinised. As a result TV has the ability to be much more engaging with the viewer and the coverage can be emotionally engaging. National TV carries a larger audience so the ability to secure mass audience reach, getting messages and branding across in a larger scale is there. It carries huge impact and influence. However, TV slots are harder to come by, competition to secure an opportunity is greater and when you do get one, air time is often very short. This means that in a live interview you need to get branding and messages out quickly and concisely; with pre-recorded clips the branding is more likely to come in the form of an aston – words on the screen, most likely a reference to a client’s position and company. However, the impact and clout of TV often makes it the ‘Holy Grail’ for some clients with the perception and buzz it carries. Regional TV should not be overlooked either. With its wide audience reach, it is also a fantastic opportunity to secure great pick up for a client and viewers tend to have an appetite for good local stories and case studies relevant to the area. Overall, both radio and television are excellent ways of communicating messages, each bringing their own advantages and disadvantages to the table – so it’s worth considering all factors before launching your PR campaign. A mixed campaign of radio and TV can be hugely effective, but just make sure spokespeople and case studies are available on the day and the day before. Balancing all coverage between TV and radio can be tough. It is useful to have multiple spokespeople and decide who you want for what and where they will be so you are able to fulfil all coverage demands and maximise your campaign’s potential. Can’t decide which to go for or how to manage both? Have a look through some of our case studies here http://www.shoutcommunications.co.uk/our-work/ or give us a call to talk through your next campaign. 020 7 240 7373 for Catherine or Arthur.